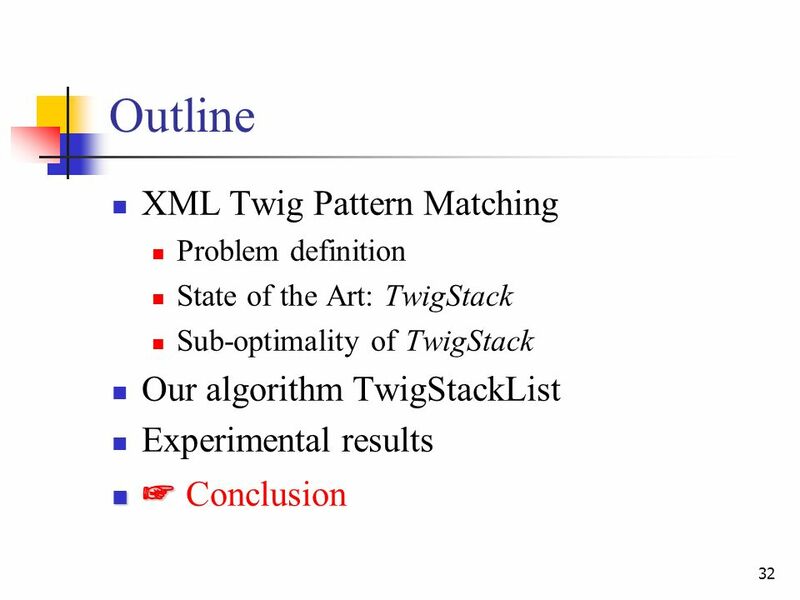 1 Efficient Processing of XML Twig Patterns with Parent Child Edges: A Look-ahead Approach Jiaheng Lu, Ting Chen, Tok Wang Ling National University of. 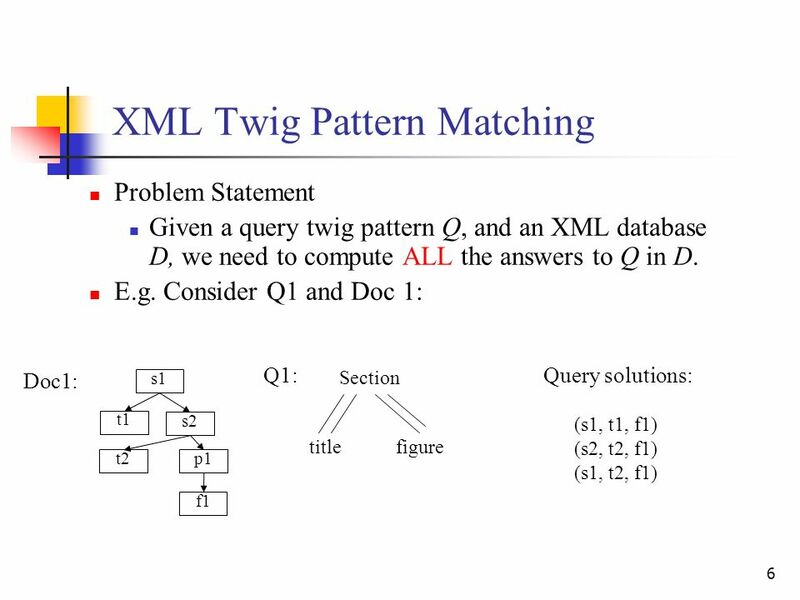 1 1 Efficient Processing of XML Twig Patterns with Parent Child Edges: A Look-ahead Approach Jiaheng Lu, Ting Chen, Tok Wang Ling National University of Singapore Nov. 11. 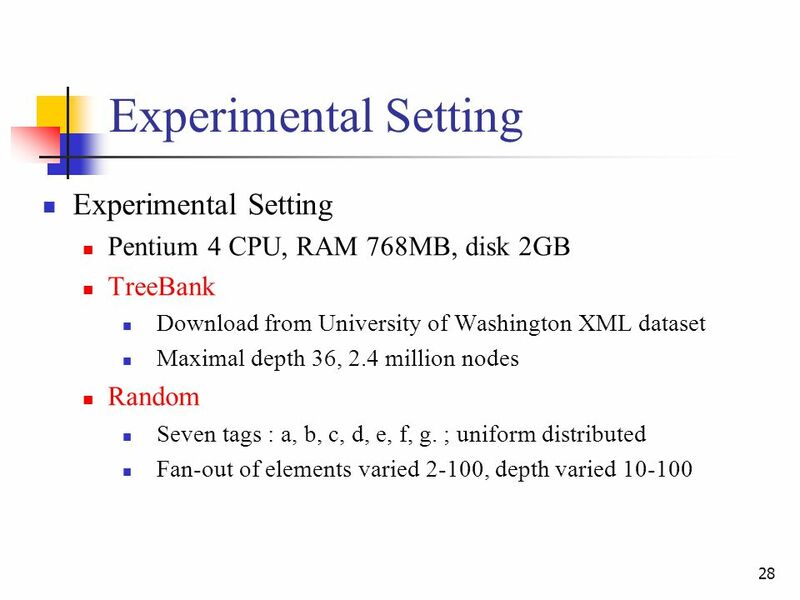 2004 CIKM 2004 Washington D.C. U.S.A.
7 7 Previous work: TwigStack TwigStack 2 : a holistic approach Two-phase algorithm: Phase 1 TwigJoin: intermediate root-leaf paths are outputted Phase 2 Merge: merge the intermediate path list to get the result 2. N. Bruno, D. Srivastava, and N. Koudas. 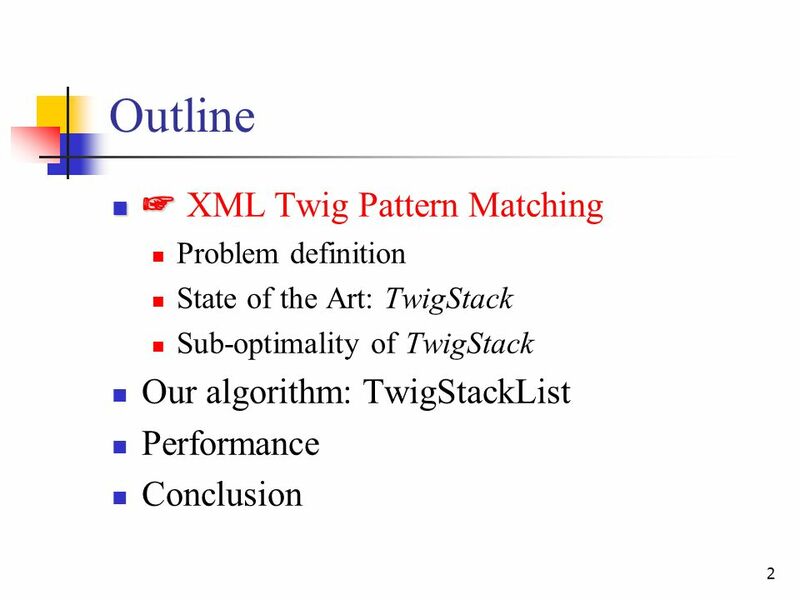 Holistic twig joins: optimal xml pattern matching. In In Proceedings of ACM SIGMOD, 2002. 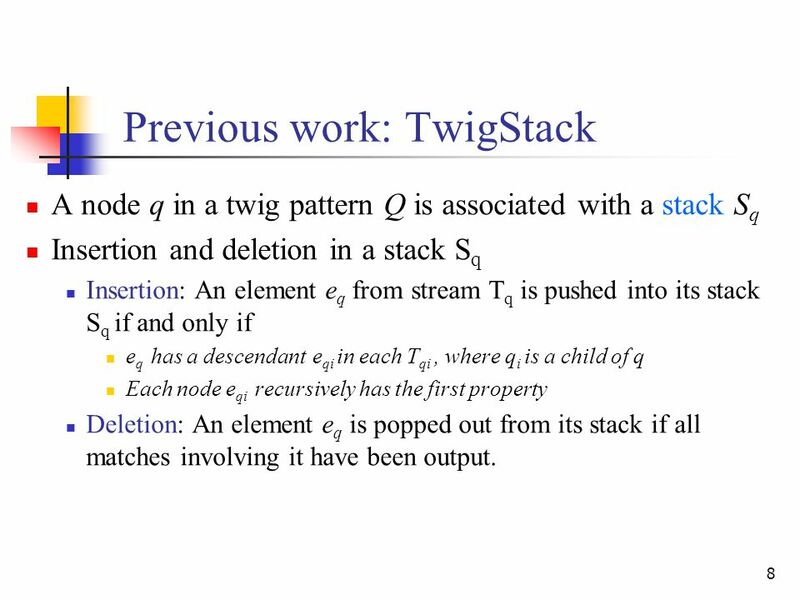 8 8 Previous work: TwigStack A node q in a twig pattern Q is associated with a stack S q Insertion and deletion in a stack S q Insertion: An element e q from stream T q is pushed into its stack S q if and only if e q has a descendant e qi in each T qi, where q i is a child of q Each node e qi recursively has the first property Deletion: An element e q is popped out from its stack if all matches involving it have been output. 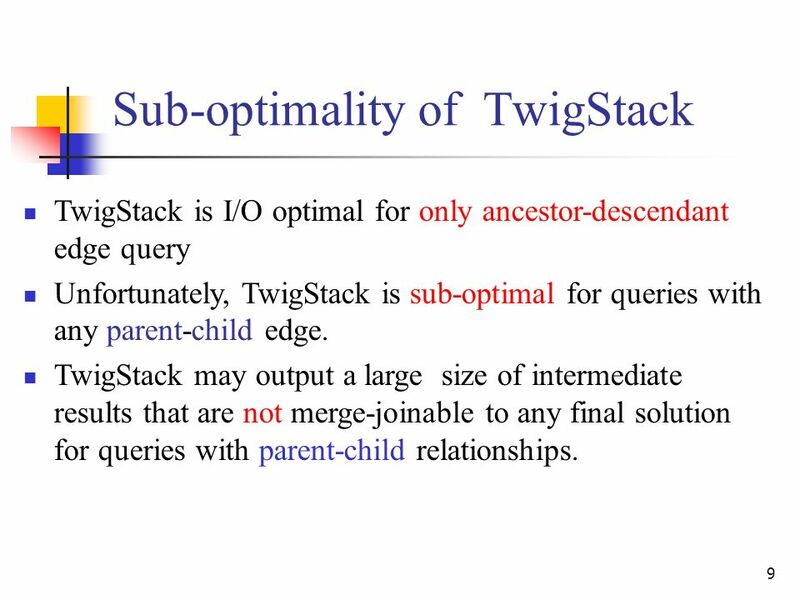 9 9 Sub-optimality of TwigStack TwigStack is I/O optimal for only ancestor-descendant edge query Unfortunately, TwigStack is sub-optimal for queries with any parent-child edge. 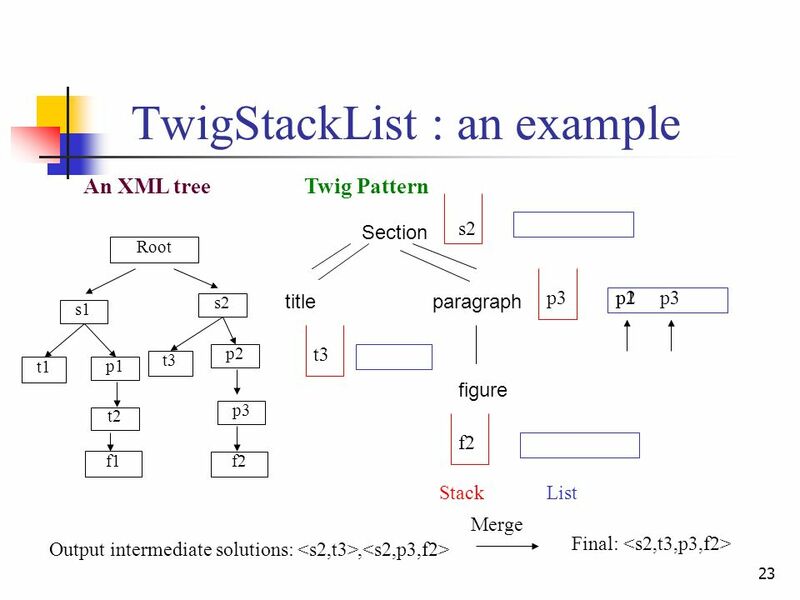 TwigStack may output a large size of intermediate results that are not merge-joinable to any final solution for queries with parent-child relationships. 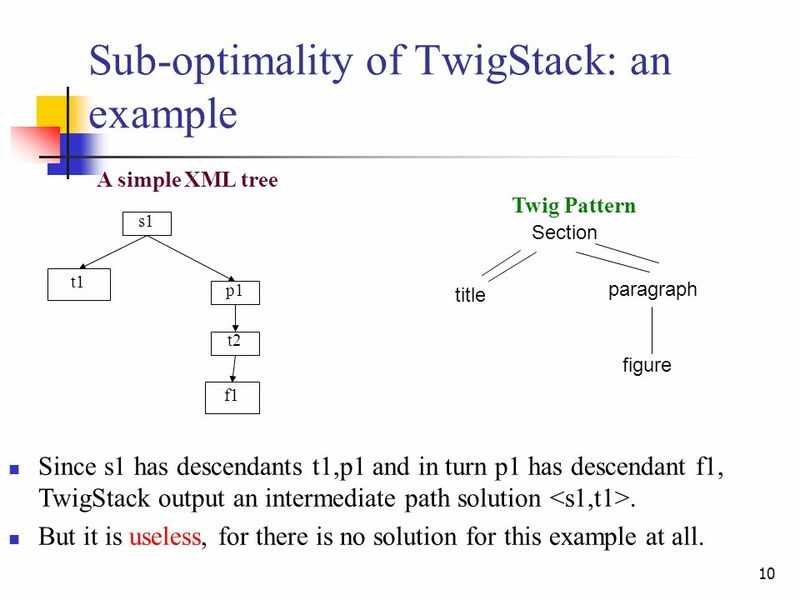 10 10 Sub-optimality of TwigStack: an example Twig Pattern s1 p1 f1 t2 t1 Section title paragraph figure A simple XML tree Since s1 has descendants t1,p1 and in turn p1 has descendant f1, TwigStack output an intermediate path solution. But it is useless, for there is no solution for this example at all. 11 11 Main problem and our experiment TwigStack might output some intermediate results that are useless to query answers. 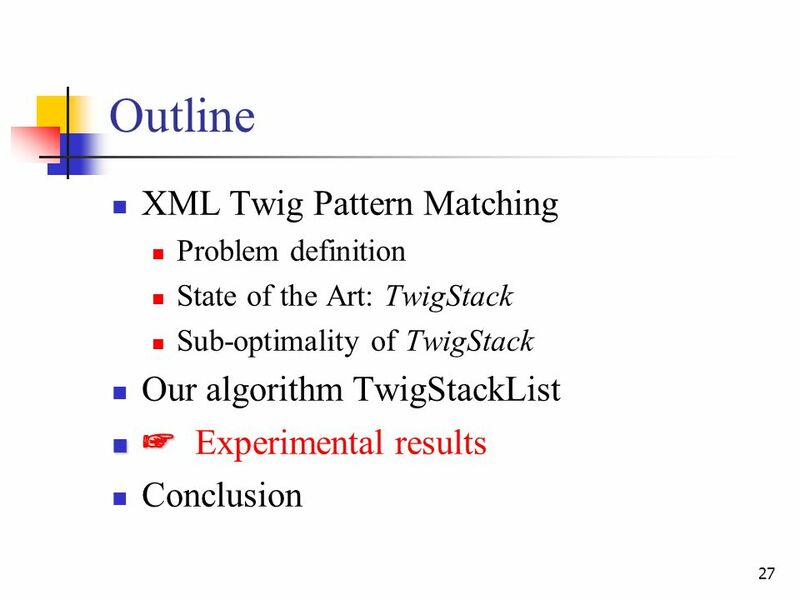 To have a better understanding, we perform TwigStack on real dataset. Data set : TreeBank[from U. of Washington XML datasets] Queries: Q1:VP [/DT] //PRP_DOLLAR_ Q2: S//NP[//PP/TO][/VP/_NONE_]/JJ Q3: S [/JJ] /NP All queries contain parent-child relationships. 12 12 Our experimental results Intermediate paths by TwigStack Merge- joinable paths Percentage of useless intermediate paths Q110,663599.9% Q224,4934999.5% Q370,9671099.9% Most intermediate paths do not contribute to final answers due to parent-child edges! 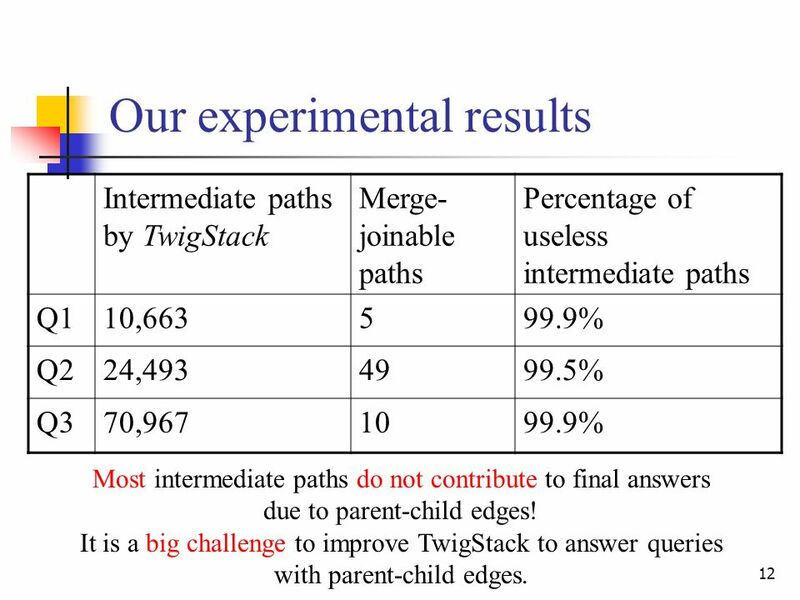 It is a big challenge to improve TwigStack to answer queries with parent-child edges. 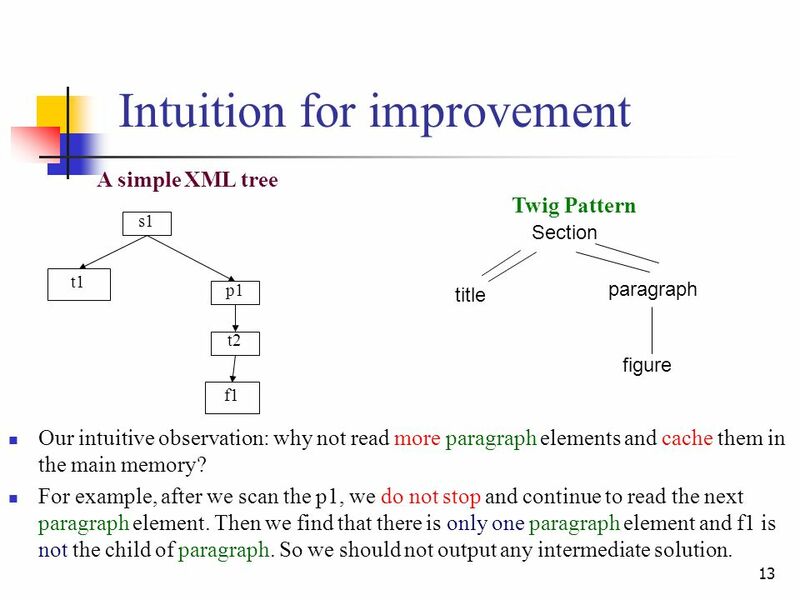 13 13 Intuition for improvement Twig Pattern s1 p1 f1 t2 t1 Section title paragraph figure A simple XML tree Our intuitive observation: why not read more paragraph elements and cache them in the main memory? For example, after we scan the p1, we do not stop and continue to read the next paragraph element. Then we find that there is only one paragraph element and f1 is not the child of paragraph. So we should not output any intermediate solution. 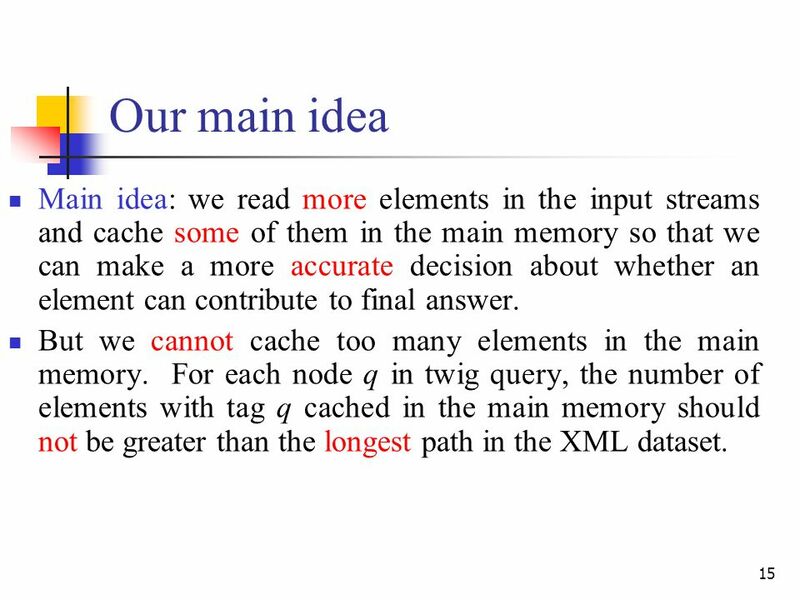 15 15 Our main idea Main idea: we read more elements in the input streams and cache some of them in the main memory so that we can make a more accurate decision about whether an element can contribute to final answer. But we cannot cache too many elements in the main memory. 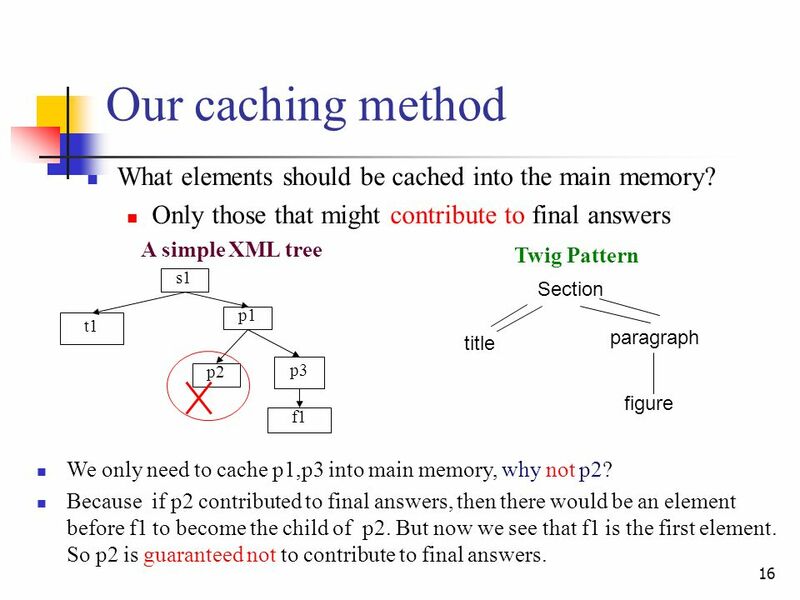 For each node q in twig query, the number of elements with tag q cached in the main memory should not be greater than the longest path in the XML dataset. 17 17 Our criteria for pushing an element to stack The criteria for an element to be pushed into stack is very important for controlling intermediate results. Why? Because, once an element is pushed into stack, then this element is ready to output. So less elements are pushed into stack, less intermediate results are output. 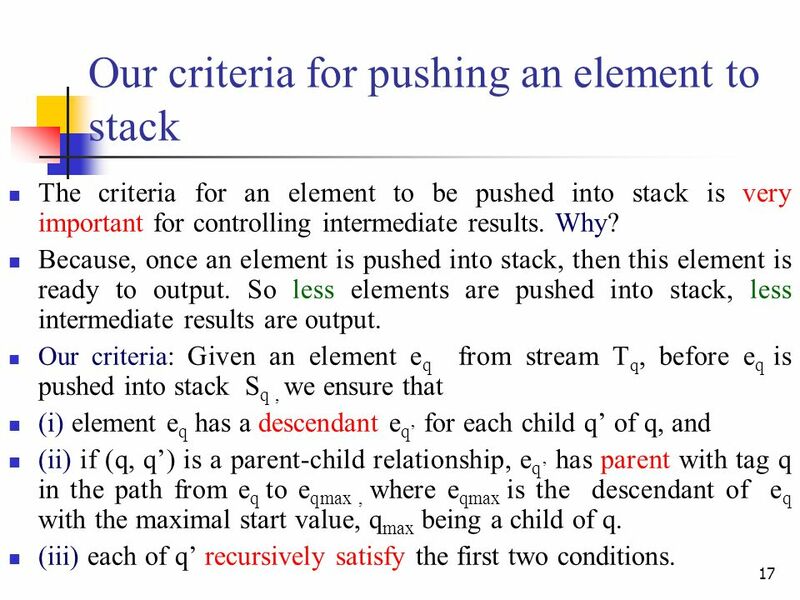 Our criteria : Given an element e q from stream T q, before e q is pushed into stack S q, we ensure that (i) element e q has a descendant e q for each child q of q, and (ii) if (q, q) is a parent-child relationship, e q has parent with tag q in the path from e q to e qmax, where e qmax is the descendant of e q with the maximal start value, q max being a child of q. (iii) each of q recursively satisfy the first two conditions. 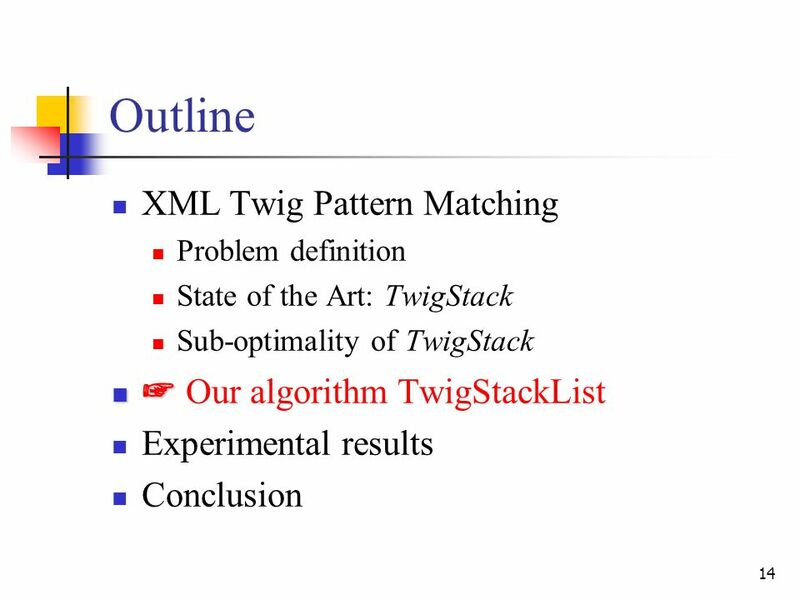 19 19 Our algorithm: TwigStackList We propose a novel holistic twig algorithm TwigStacklist to evaluate a twig query. Unique features of TwigStackList: It considers the parent-child edge in the query There is a list for each query node to cache elements that likely participate in final solutions. It identifies a broader class of optimal queries. 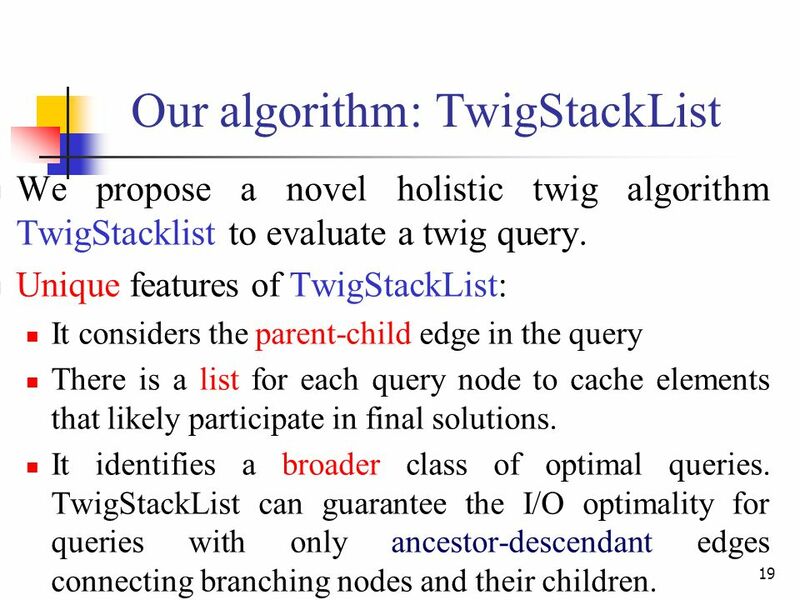 TwigStackList can guarantee the I/O optimality for queries with only ancestor-descendant edges connecting branching nodes and their children. 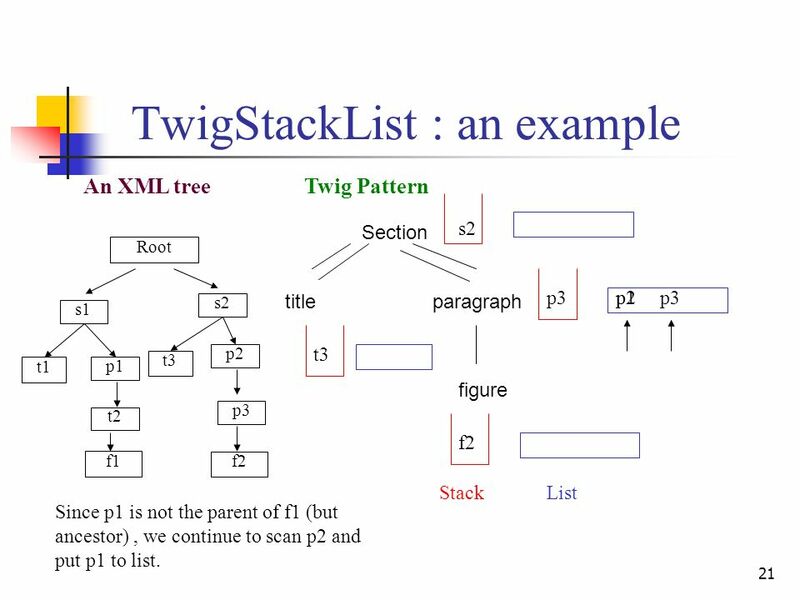 20 20 TwigStackList : an example Twig Pattern Section titleparagraph figure An XML tree StackList s1 p1 p3 f1 t1 t2 s2 p2 t3 f2 Root p2 s2 t3 f2 p3 p1 Scan s1, t1, p1,f1. 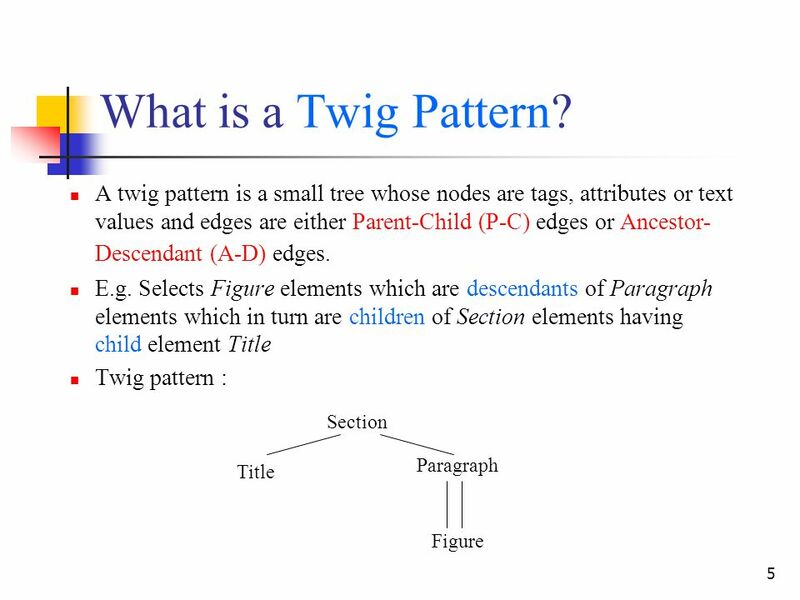 21 21 TwigStackList : an example Twig Pattern Section titleparagraph figure An XML tree StackList s1 p1 p3 f1 t1 t2 s2 p2 t3 f2 Root p2 s2 t3 f2 p3 p1 Since p1 is not the parent of f1 (but ancestor), we continue to scan p2 and put p1 to list. 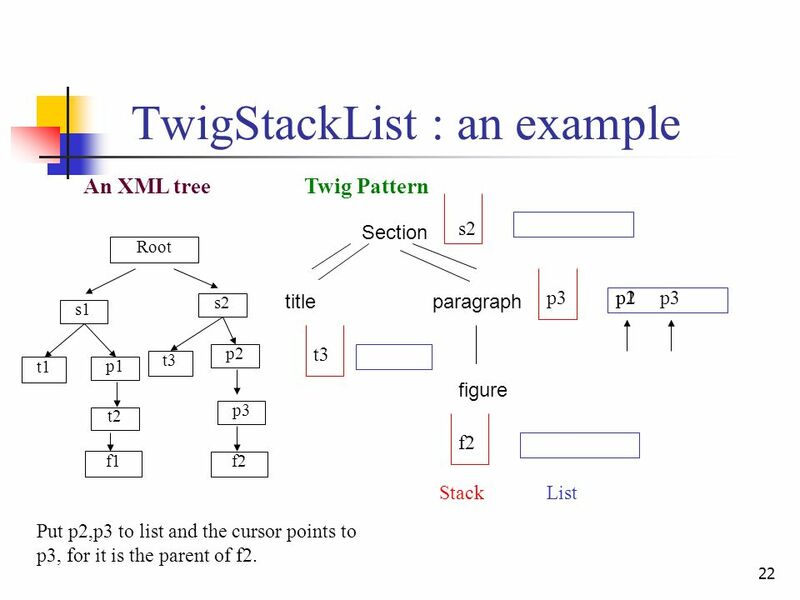 22 22 TwigStackList : an example Twig Pattern Section titleparagraph figure An XML tree StackList s1 p1 p3 f1 t1 t2 s2 p2 t3 f2 Root p2 s2 t3 f2 p3 p1 Put p2,p3 to list and the cursor points to p3, for it is the parent of f2. 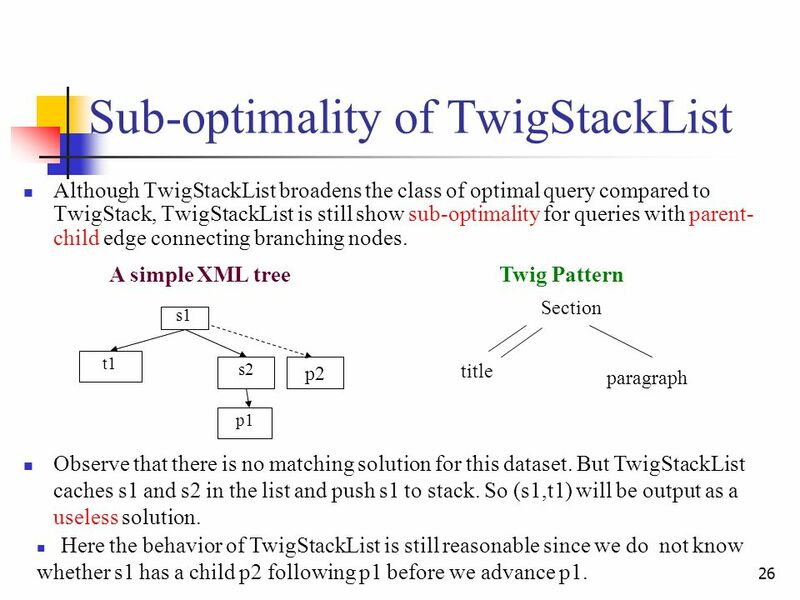 25 25 Sub-optimality of TwigStackList Although TwigStackList broadens the class of optimal query compared to TwigStack, TwigStackList is still show sub-optimality for queries with parent- child edge connecting branching nodes. Twig Pattern s1 s2 p1 t1 Section title paragraph A simple XML tree Observe that there is no matching solution for this dataset. But TwigStackList caches s1 and s2 in the list and push s1 to stack. So (s1,t1) will be output as a useless solution. 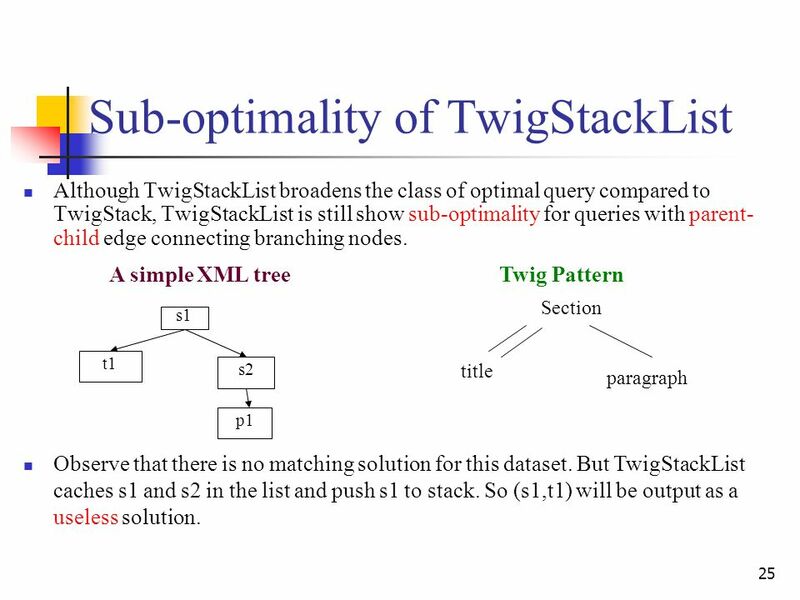 26 26 Sub-optimality of TwigStackList Although TwigStackList broadens the class of optimal query compared to TwigStack, TwigStackList is still show sub-optimality for queries with parent- child edge connecting branching nodes. 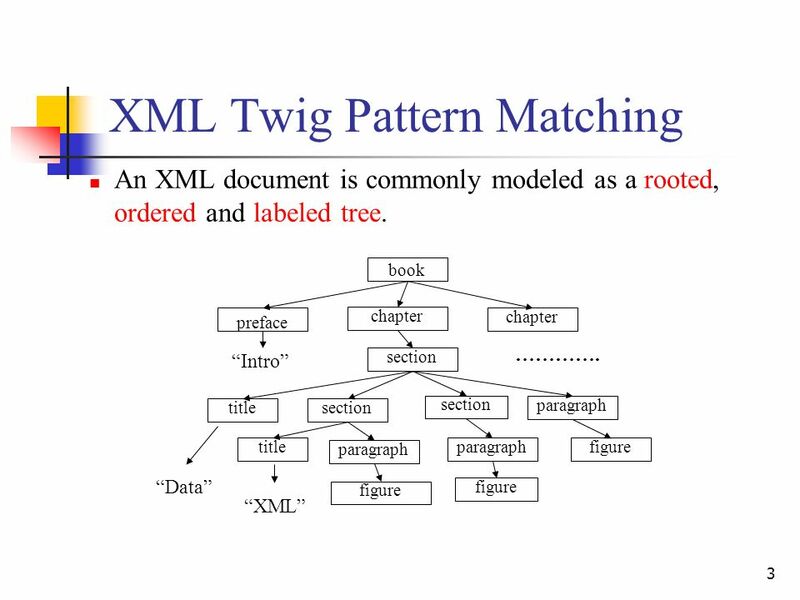 Twig Pattern s1 s2 p1 t1 Section title paragraph A simple XML tree Observe that there is no matching solution for this dataset. But TwigStackList caches s1 and s2 in the list and push s1 to stack. So (s1,t1) will be output as a useless solution. 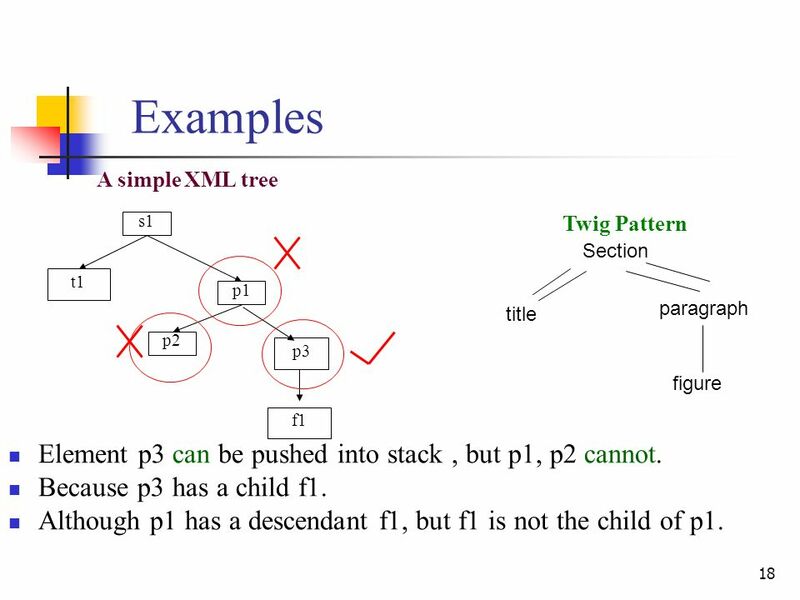 p2 Here the behavior of TwigStackList is still reasonable since we do not know whether s1 has a child p2 following p1 before we advance p1. 30 30 Performance analysis We have three observations: (1) when queries contain only ancestor-descendant edges, two algorithms have similar performance. See Q1. 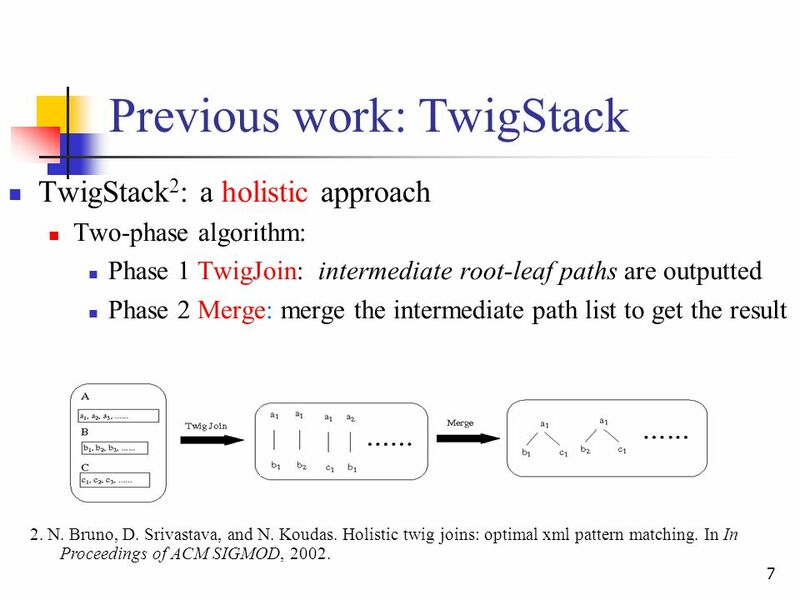 (2)When edges connecting branching nodes contain only ancestor-descendant relationships, TwigStack is optimal, but TwigStack show the sub-optimal. 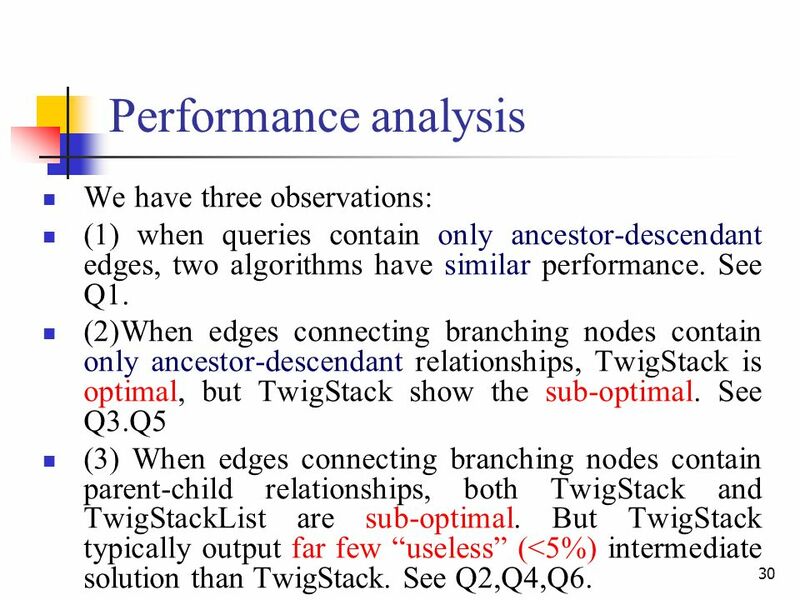 See Q3.Q5 (3) When edges connecting branching nodes contain parent-child relationships, both TwigStack and TwigStackList are sub-optimal. 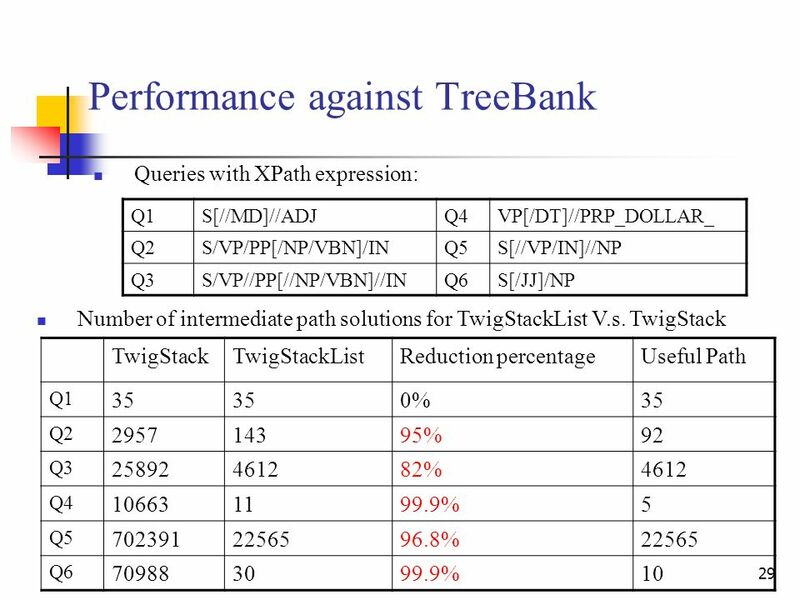 But TwigStack typically output far few useless (<5%) intermediate solution than TwigStack. See Q2,Q4,Q6. 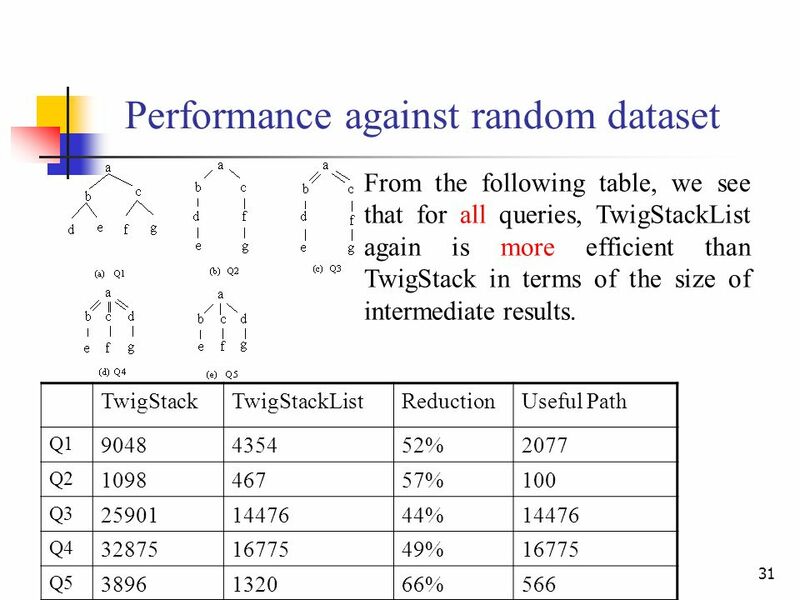 31 31 Performance against random dataset TwigStackTwigStackListReductionUseful Path Q1 9048435452%2077 Q2 109846757%100 Q3 259011447644%14476 Q4 328751677549%16775 Q5 3896132066%566 From the following table, we see that for all queries, TwigStackList again is more efficient than TwigStack in terms of the size of intermediate results. 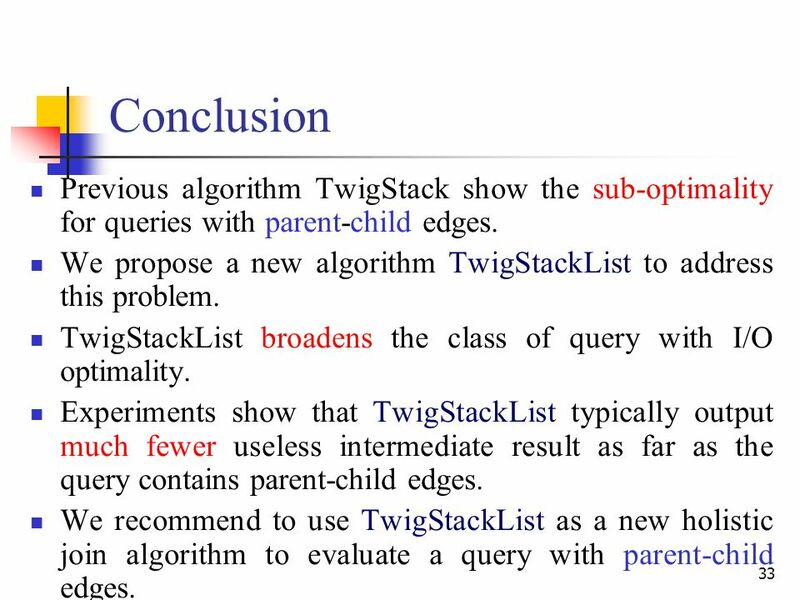 33 33 Conclusion Previous algorithm TwigStack show the sub-optimality for queries with parent-child edges. We propose a new algorithm TwigStackList to address this problem. 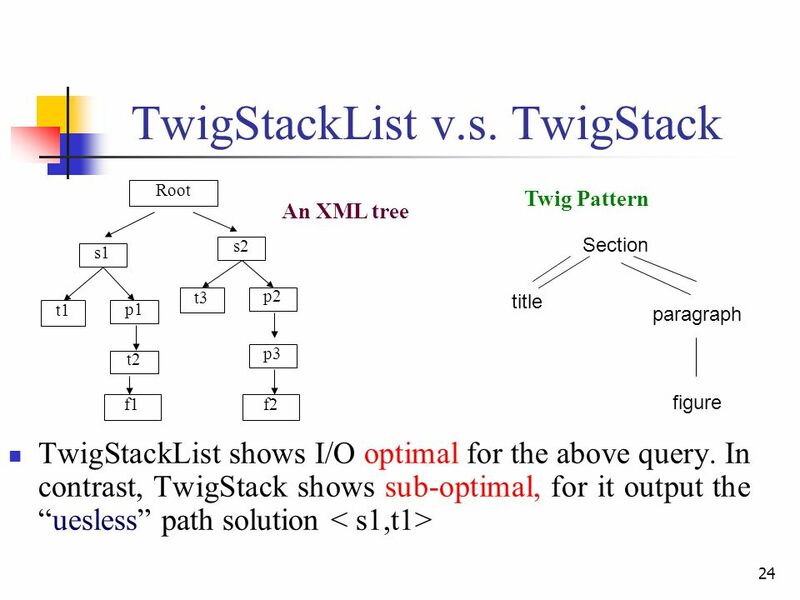 TwigStackList broadens the class of query with I/O optimality. Experiments show that TwigStackList typically output much fewer useless intermediate result as far as the query contains parent-child edges. We recommend to use TwigStackList as a new holistic join algorithm to evaluate a query with parent-child edges. 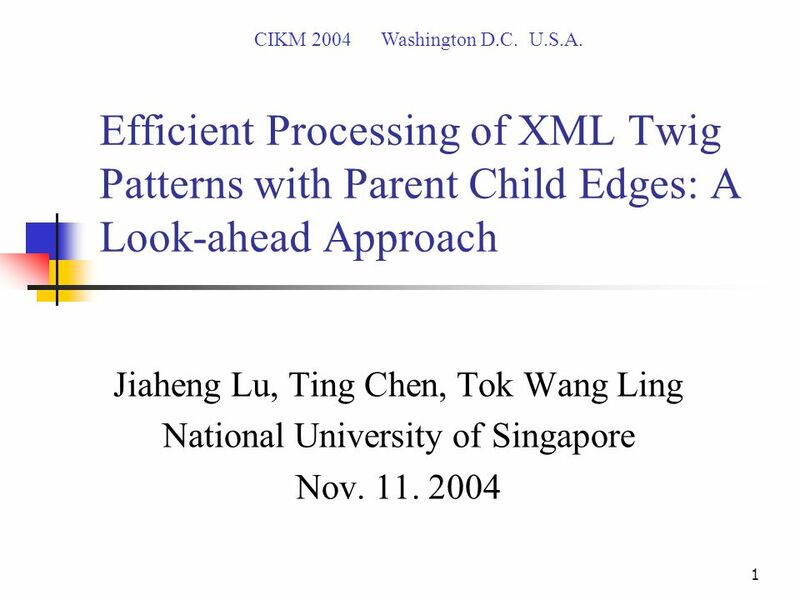 Download ppt "1 Efficient Processing of XML Twig Patterns with Parent Child Edges: A Look-ahead Approach Jiaheng Lu, Ting Chen, Tok Wang Ling National University of." 1 Concurrency: Deadlock and Starvation Chapter 6. 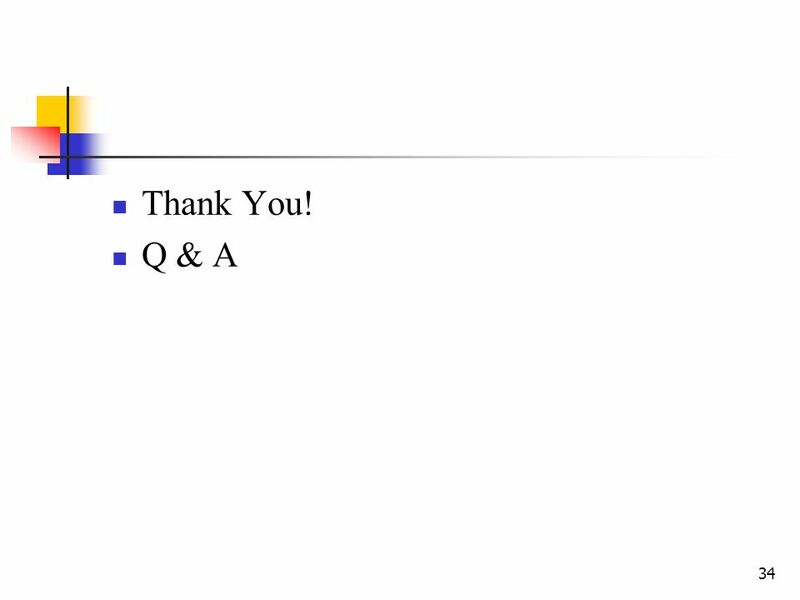 Copyright © 2008 Pearson Education, Inc. Publishing as Pearson Addison-Wesley Chapter 2 Introduction to XHTML Programming the World Wide Web Fourth edition. 1 Vorlesung Informatik 2 Algorithmen und Datenstrukturen (Parallel Algorithms) Robin Pomplun. Jiaheng Lu, Ting Chen and Tok Wang Ling National University of Singapore Finding all the occurrences of a twig. APWeb 2004 Hangzhou, China 1 Labeling and Querying Dynamic XML Trees Jiaheng Lu and Tok Wang Ling School of Computing National University of Singapore. 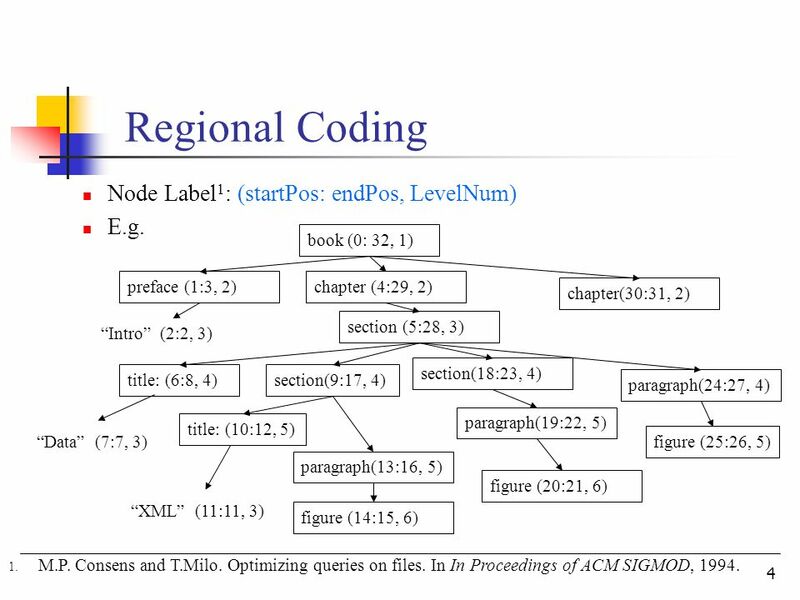 From Region Encoding To Extended Dewey: On Efficient Processing of XML Twig Pattern Matching Jiaheng Lu, Tok Wang Ling, Chee-Yong Chan, Ting Chen National. On Boosting Holism in XML Twig Pattern Matching Using Two Data Streaming Techniques Presenter: Lu Jiaheng Supervisor: Prof. Ling Tok Wang Joint work: Chen.